Hello friends. Today I am going to share a widget which many of the readers have requested to add. This widget is inspired by my previous widget. This slider has a responsive layout and is very attractive. Its fully automated you just have to add the URL of your blog once and the images, titles and links will be updated on their own. This slider crawls and lists the recent posts of the blog. This widget looks somewhat like the one seen on engadget.com. This slider is very attractive and eye-catching too. A live working demo of this widget can be seen below. After adding the code change the URL in Bold Purple in the field blogURL with your own blog's URL. There are other options too for advance users. After editing the code, save the widget and finally save the template. You are done now. Now you and your visitors can see this awesome slider in your blog. The thumbnails aren't created the way they are done. This makes pictures that are to narrow or too wide to look funny. Any chance to fix that? See different blogs have different types of thumbnail and I have to select a layout which will suit most type of thumbnail. Also increasing thumbnail will lead to increasing the block size which is not entertained. Awesome... Such a simple way to explain ... thnak u soo much .. My blog looks more attractive now.. Some thumbnails aren't appearing in the slider. Can you please help. Thanks! How to add this below sliding widget as like you ? I have another slider in my blog. when I entered this slider somehow the other one stop working. it cannot exist both at same time? The issue would be of CSS i.e. both the sliders have been assigned the same name. OIC. So both of my current one and this cannot use together. Too bad, this is awesome widget. The script cannot fetch some of my post thumbnails is there any fix to that? Thanks, it is great! Not all thumblines are showing, can you help me to fix that? Hi, it was working fine, now it does't load the posts anymore, please, can you help? 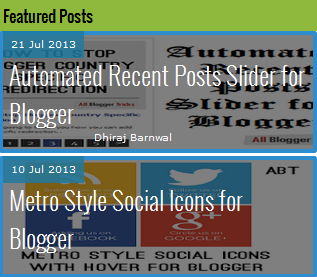 Its an awesome slider for blogger. But I don't want to appear the author name below title how to fix that??? can i add Slider on this site www.googlesportsclub.com ? fabulous post thanks for share informative article.